If you are looking to spruce up your patio or backyard for entertaining, family functions or any other reason, you are likely researching some great ideas you can use to transform your space from just another fenced-in lot to something unique, fantastic and utterly you. Select a theme based on your location. The first thing you need to consider is your climate and geography. If you live in the wet, loamy Pacific Northwest, you should probably forego planting a cactus in the backyard. If you live in Southern Oklahoma, you will want to avoid water-hungry flowers like cannas, turtleheads and elephant’s ears. Of course, that’s obvious, but the point here is that in researching the kind of plants that grow best in your location’s climate, you can select a theme for your foliage. If you like a very verdant, full look, select lots of leafy ground cover, like ivy or ferns. If you are interested in a more manicured look, choose short, elegant trees that have narrow trunks, like ficus or Japanese maple. Choose gardens that suit you the best. If you have plenty of free time and love to get your hands dirty, that vegetable garden you’ve considering will provide plenty of food – and lots of beauty – to your new backyard. If you have a hectic schedule or prefer to entertain often, you may consider going with low-maintenance garden plants and flowers such as peonies, miscanthus, sage, daisies and fireweed. Make sure there is plenty of space. It can be easy to go overboard with design elements like awnings, fire pits, fountains and the like, but one of the principles of great design is using space effectively. If you clutter your yard with beautiful things, they all blend together and don’t stand out to the human eye. Rather, use space around your best plants and design elements to make them pop. More space also means more walkability and utility, so your backyard is a more versatile area for entertaining, gathering and spending time outside. Maximize your budget. There are many money-saving tips you can use to design the backyard of your dreams on a budget – and the more money you save as you go along, the more you can add or customize as you go through the process. For instance, if you install a barbecue island outside, go with a stainless steel countertop rather than stone or marble – not only will the cooking and food preparation surface be easier to clean, it will cost thousands of dollars less. Add fire and water elements. There is something primal in human beings that makes us love running water and gathering around fires. By adding elements of both to your backyard, you will create a truly unique space. Fire pits can go anywhere in the yard, but they seem to work best as a focal point of the space, with plenty of comfortable seats surrounding them so that people can congregate, talk, drink and laugh around a roaring blaze. For your water elements, consider the Zen principle of hide-and-reveal: Place a small fountain off in the corner of the yard or somewhere else that is hidden from the general view of the patio, so that you and your guests can always hear it babbling and bubbling, but it has to be “discovered.” This will make it all the more pleasurable, especially if it’s designed to be surrounded by a beautiful garden! There are many, many other principles of backyard design – far too many to list in a single article – but these five tips will get you started. 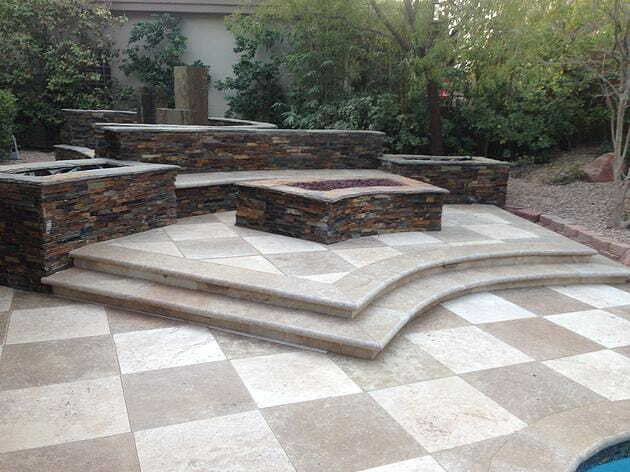 Now get out there and design the patio or backyard of your dreams today!